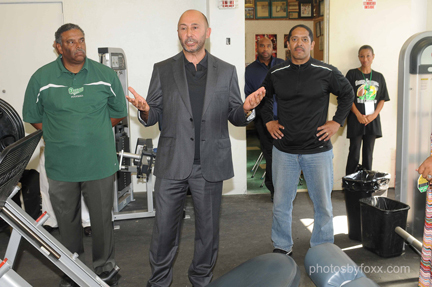 The Dorsey High School football team, coaches and administrators celebrated this past Friday with Los Angeles real estate developer Sonny Astani and former Labor Leader, Martin Ludlow with a new state-of-the art weight room. Astani made his donation to the Dorsey Football Boosters, a non-profit organization which was created by Ludlow to help purchase uniforms, medical supplies, training equipment and college-bound computer programs. Astani’s donation enabled the boosters to completely renovate the school’s weight room. Now, student-athletes for the Dorsey Dons can work out with new free weights and gym equipment in a freshly-painted facility adorned with state-of-the-art flat screen televisions and audio systems. High school game films can now be assembled and viewed on a digital editing system. The ceremony on Friday in the weight room included Dorsey head coach Paul Knox and Dr. Reginald Sample, Dorsey principal.